, a voluminous and very ingenious political and miscellaneous writer, was born in London about 1663. He was the son of James Foe, citizen and butcher, of the parish of St. Giles’s, Cripplegate: and his grandfather was Daniel Foe, of Elton, in Northamptonshire, yeoman. How he came by the name of De Foe we are not informed; but his enemies have asserted, that he assumed the De to avoid being thought an Englishman. It certainly appeared, from the books of the chamberlain of London (which were some time ago destroyed by a fire at Guildhall) that our author was admitted, by the name of Daniel Foe, to the freedom of the ciiy by birth, Jan. 26, 1687-8. The family of De Foe were protestant dissenters, and Daniel, who had received his education at a dissenting academy at Newington Green, near London, was a dissenter upon principle and reflection. From his various writings, says his biographer, it is plain that he was a zealous defender of the principles of the dissenters, and a strenuous supporter of their politics, before the liberality of our rulers had freed this conduct from danger. He merits the praise which is due to sincerity in manner of thinking, and to uniformity in habits of acting, whatever obloquy may have been cast on his name, by attributing writings to him, which, as they belonged to others, he was studious to disavow. 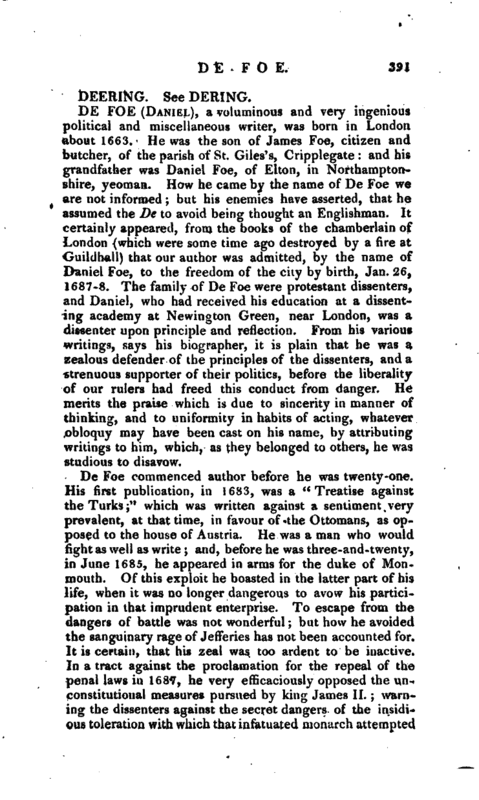 De Foe commenced author before he was twenty-one. His first publication, in 1633, was a “Treatise against the Turks;” which was written against a sentiment very prevalent, at that time, in favour of the Ottomans, as opposed to the house of Austria. He was a man who would fight as well as write; and, before he was three-and-twenty, in June 1685, he appeared in arms for the duke of Monmouth. Of this exploit he boasted in the latter part of his life, when it was no longer dangerous to avow his participation in that imprudent enterprise. To escape from the dangers of battle was not wonderful; but how he avoided the sanguinary rage of Jefferies has not been accounted for. It is certain, that his zeal was too ardent to be inactive. In a tract against the proclamation for the repeal of the penal laws in 1687, he very efficaciously opposed the unconstitutional measures pursued by king James II. ; warning the dissenters against the secret dangers of the insidious toleration with which that infatuated monarch attempted | to deceive them. But neither this tract, nor that against the Turks, did he think proper to re-publish in the subsequent collection of his writings. As he had endeavoured to promote the revolution by his pen and his sword, he had the satisfaction of participating in the pleasures and advantages of that great event. During the hilarity of the moment, the lord-mayor of London asked king William to partake of the city feast on the 29th of October, 1689. Every honour was paid to the sovereign of the people’s choice. A regiment of volunteers, composed of the chief citizens, and commanded by the celebrated earl of Peterborough, attended the king and queen from Whitehall to the Mansion-house. Among these troopers, gallantly mounted, and richly accoutred, was Daniel De Foe. While our author thus courted notice, he is said to have acted as a hosier in Freeman’s-court, Cornhill; but with the usual imprudence of superior genius, he was carried by his vivacity into companies who were gratified by his wit. He spent those hours with a society for the cultivation of polite learning which he ought to have employed in the calculations of the counting-house; and being obliged to abscond from his creditors in 1692, he attributed those misfortunes to the war, which were probably owing to his own misconduct. An angry creditor took out a commission of bankruptcy, which was superseded on the petition of those to whom he was most indebted, who accepted a composition on his single bond. This he punctually paid, by the efforts of unwearied diligence. But some of those creditors, who had been thus satisfied, falling afterward into distress themselves, De Foe voluntarily paid them their whole claims; being then in rising circumstances from king William’s favour. This is an example of integrity, which it would be unjust to conceal. Being reproached, in 1705, by lord Haversham, with mercenariness, our author feelingly observes, how, with a numerous family, and no helps but his own industry, he had forced his way with undiminished diligence, through a sea of misfortunes, and reduced his debts, exclusive of composition, from seventeen thousand to less than five thousand pounds. He had been concerned Jn some pantile works near Tilbury-fort, and these he continued to carry on, though probably with no great success. | While he was yet under thirty years of age, and had mortified no great man by his satire, nor offended any party by his pamphlets, he had acquired friends by his powers of pleasing, who did not, with the usual instability of friendship, desert him in his distresses. They offered to settle him as a factor at Cadiz, where, as a trader, he had some previous correspondence. But as he assures us in his old age, “Providence, which had other work for him to do, placed a secret aversion in his mind to quitting England.” He was prompted by a vigorous mind to think of a variety of schemes for the benefit of his country; and in January 1697, he published his “Essay upon Projects.” In this, among other projects which shew an extensive range of knowledge, he suggests to king William the imitation of Louis XIV, in the establishment of a society for encouraging polite learning, refining the English language, and preventing barbarisms of manners. Prior and Swift afterwards recommended the same, as far as regards language. In 1695, De Foe was appointed accomptant to the commissioners for managing the duties on glass; but he lost, this place in 1699, when the tax was suppressed by act of parliament. 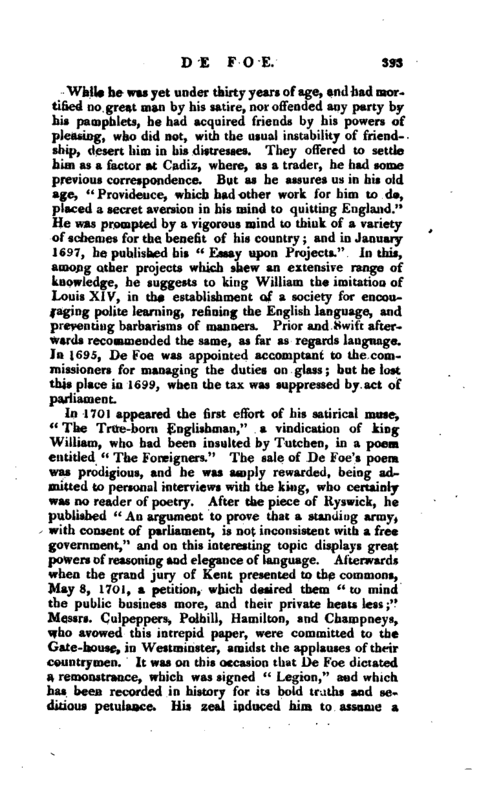 In 1701 appeared the first effort of his satirical muse, “The True-born Englishman,” a vindication of king William, who had been insulted by Tutchen, in a poem entitled “The Foreigners.” The sale of De Foe’s poem was prodigious, and he was amply rewarded, being admitted to personal interviews with the king, who certainly was no reader of poetry. After the piece of Ryswick, he published “An argument to prove that a standing army, with consent of parliament, is not inconsistent with a free government,” and on this interesting topic displays great. powers of reasoning and elegance of language. Afterwards when the grand jury of Kent presented to the commons, MayS, 1701, a petition, which desired them “to mind the public business more, and their private heats less” Messrs. Culpeppers, Polhill, Hamilton, and Champneys, who avowed this intrepid paper, were committed to the Gate-house, in Westminster, amidst the applauses of their countrymen. It was on this occasion that De Foe dictated a remonstrance, which was signed “Legion,” and which, has been recorded in history for its bold truths and seditious petulance. His zeal induced him to assume a | woman’s dress, while he delivered this paper to Harley, the speaker, as he entered the house of commons. It was then also that our author published “The Original Power of the collective Body of the People of England, examined and asserted:” This seasonable treatise he dedicated to king William, in a dignified strain of nervous eloquence. ^ It is not the least of the extraordinaries of your majesty’s character,“says he,” that, as yon are king of your people, so yon are the people’s king; a title, which, as it is the most glorious, so it is the most indisputable.“To the lords and commons he addresses himself in a similar tone: the vindication of the original right of all men to the government of themselves, he tells them, is so far from being a derogation from, that it is a confirmation of their legal authority.” Every lover of liberty,“says his biographer, Mr. Chalmers,” must be pleased with the perusal of a treatise, which vies with Locke’s famous tract in powers of reasoning, and is superior to it in the graces of style.“De Foe, soon after, published” The Freeholder’s Plea against Stockjobbing Elections of Parliament Men." How much soever king William may have been pleased with the “True-born Englishman,” he was perhaps little gratified by our author’s “Reasons against a War with France.” This is one of the finest tracts in the English language. 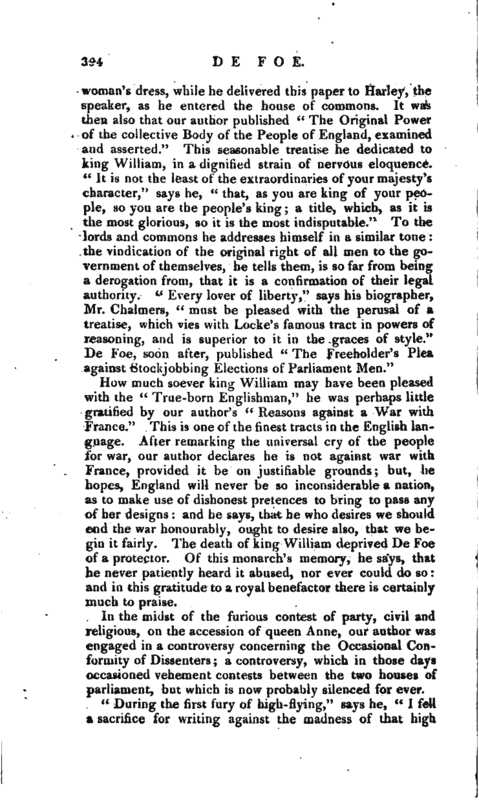 After remarking the universal cry of the people for war, our author declares he is not against war with France, provided it be on justifiable grounds; but, he hopes, England will never be so inconsiderable a nation, as to make use of dishonest pretences to bring to pass any of her designs: and he says, that he who desires we should end the war honourably, ought to desire also, that we begin it fairly. The death of king William deprived De Foe of a protector. Of this monarch’s memory, he says, that he never patiently heard it abused, nor ever could do so: and in this gratitude to a royal benefactor there is certainly much to praise. In the midst of the furious contest of party, civil and religious, on the accession of queen Anne, our author was engaged in a controversy concerning the Occasional Conformity of Dissenters; a controversy, which in those days occasioned vehement contests between the two houses of parliament, but which is now probably silenced for ever. “During the first fury of high-flying,” says he, “I fell a sacrifice for writing against the madness of that high | party, and in the service of the dissenters.” He alludes here to “The shortest Way with the Dissenters,” which, he published in 1702, and which is a piece of exquisite irony, though there are certainly passages in it that might have shewn considerate men how much the author had been in jest, He complains how hard it was, that this should not have been perceived by all the town, and that not one man can see it, either churchman or dissenter. This is one of the strongest proofs, how much the minds of men were inflamed against each other, and how little the virtues of mutual forbearance and personal kindness existed amid the clamour of contradiction, which then shook the kingdom, and gave rise to some of the most remarkable events in our annals. The commons shewed their zeal, however they may have studied their dignity, by prosecuting several libellists. On Feb. 25, 17o3, a complaint was made in the house of commons, of “The Shortest Way with the Dissenters,” and it was ordered to be burnt by the hands of the common hangman. During the previous twenty years of his life, his biographer observes, De Foe had been unconsciously charging a mine, which now blew himself and his family into the air. He had fought for Monmouth he had opposed king James; he had vindicated the revolution; he had panegyrized king William; he had defended the rights of the collective body of the people; he had displeased lord Godolphin and the duke of Marlborough, by objecting to the Flanders war; he had bantered sir Edward Seymour, and sir Christopher Musgrave, the tory leaders of the commons; he had just ridiculed all the high-flyers in the kingdom; and he was at last obliged to seek for shelter from the indignation of persons and parties, thus overpowering and resistless. A proclamation was issued January 1703, offering a reward of 50l. for discovering his retreat. 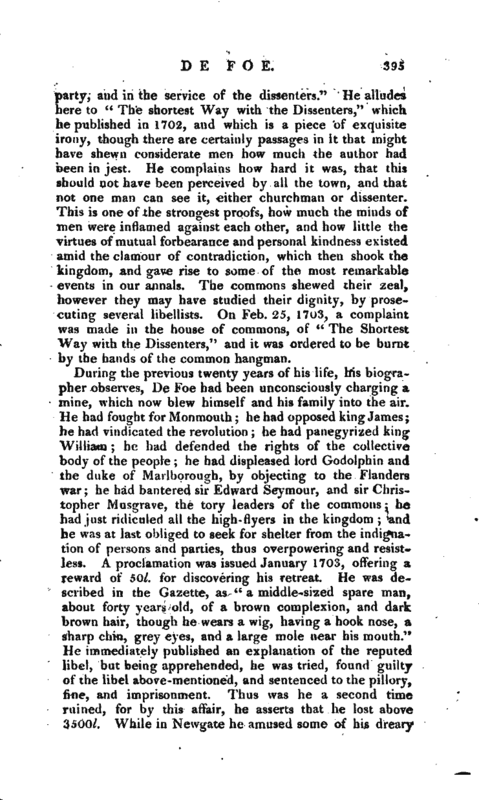 He was de^ scribed in the Gazette, as “a middle-sized spare man, about forty years old, of a brown complexion, and dark brown hair, though he wears a wig, having a hook nose, a sharp chin, grey eyes, and a large mole near his mouth.” He immediately published an explanation of the reputed libel, but being apprehended, he was tried, found guilty of the libel above-mentioned, and sentenced to the pillory, fine, and imprisonment. Thus was he a second time ruined, for by this affair, he asserts that he lost above 3500l. While in Newgate he amused some of his dreary | hours, by “A Hymn to the Pillory,” in which there are some generous sentiments and pointed satire. 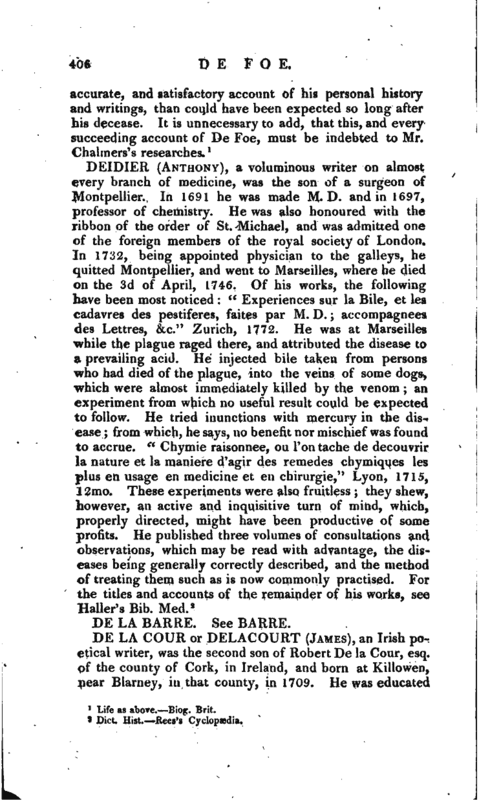 In July 1704, our author published “The Storm; or, a Collection of the most remarkable Casualties which happened in the Tempest, on the 23d of November, 1703.” In this, De Foe displays more science and literature than he has been generally supposed to possess. While he lay friendless in Newgate, his family ruined, and he himself without hopes of deliverance, a verbal message was brought him from sir Robert Harley, speaker of the house of commons, afterwards earl of Oxford, desiring to know what he could do for him. Harley approved, probably, of the principles and conduct of De Foe, and might foresee, that, during a factious age, such a genius could be converted to many uses. Our author was content to intimate a wish only for his release; and when Harley became secretary of state, in April 1704, and had frequent opportunities of representing the unmerited sufferings of De Foe to the queen and to the treasurer, lord Godolphin; | yet our author continued four months longer in prison. The queen, however, inquired into his circumstances; and lord Godolphin sent a considerable sum to his wife, and to him money to pay his fine and the expence of his discharge. Here is the foundation, he says, on which be built his first sense of duty to the queen, and the indelible bond of gratitude to his first benefactor, as he calls Harley. “Let any one say, then,” he asks, “what I could have done, less or more than I have done for such a queen and such a benefactor?” All this he manfully avowed to the world, when queen Anne lay lifeless as king William, his first patron; pnd when the earl of Oxford, in the vicissitude of party, had been persecuted by faction, and overpowered, though not conquered, by violence. Being released from Newgate, in August 1704, De Foe, in order to avoid the town-talk, retired to St. Edmund’s Bury; but his retreat did not prevent persecution. 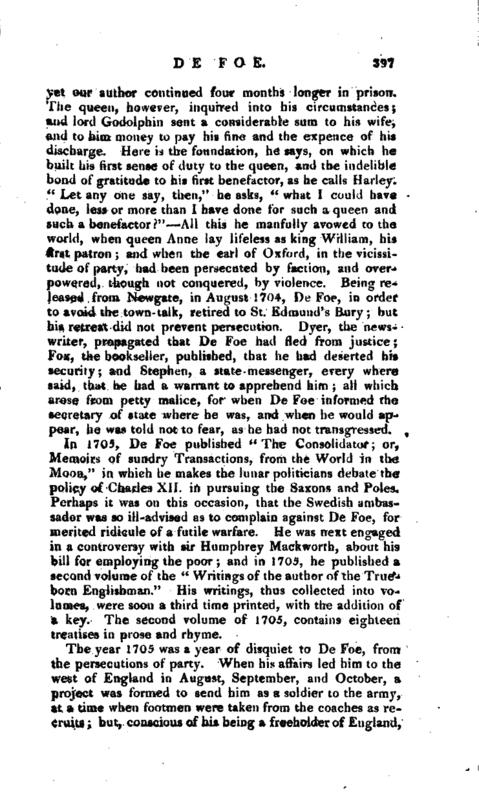 Dyer, the newswriter, propagated that De Foe had Hed from justice; Fox, the bookseller, published, that he had deserted his security; andStephen, a state -messenger, every where said, that he had a warrant to apprehend him all which arose from petty malice, for when De Foe informed the secretary of state where he was, and when he would appear, he was told not to fear, as he had not transgressed. 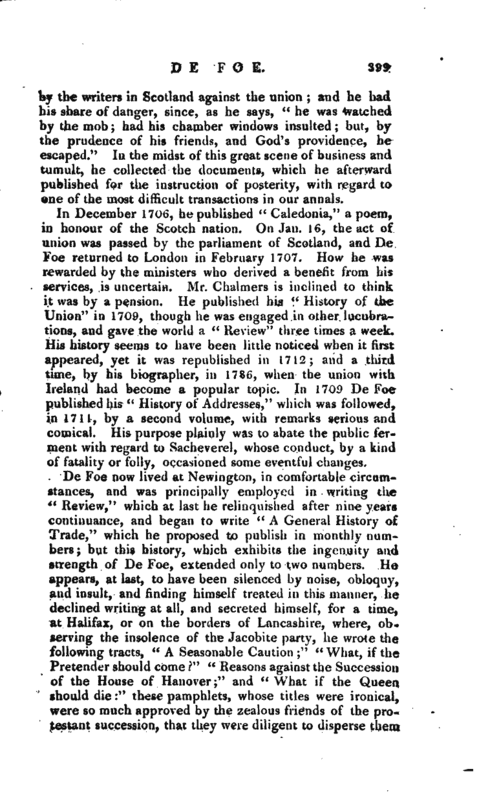 In 1705, De Foe published “The Consolidator; or, Memoirs of sundry Transactions, from the World in the jVloon,” in which he makes the lunar politicians debate the policy of Charles XII. in pursuing the Saxons and Poles, Perhaps it was on this occasion, that the Swedish ambassador was so ill-advised as to complain against De Foe, for merited ridicule of a futile warfare. He was next engaged in a controversy with sir Humphrey Mackworth, about his bill for employing the poor; and in 1705, he published a second volume of the “Writings of the author of the Trueborn Englishman.” His writings, thus collected into volumes, were soon a third time printed, with the addition of a key. The second volume of 1705, contains eighteen treatises in prose and rhyme. About this time, lord Godolphin, who knew how to discriminate characters, determined to employ De Foe on a very important commission. The queen said to him, while he kissed her hand, she had such satisfaction in his former services, that she had again appointed him for another affair, which was something nice, but the treasurer would tell him the rest. In three days he was sent to Scotland. His knowledge of commerce and revenue, his powers of insinuation, and his readiness of pen, were deemed of no small utility in promoting the union. He accordingly arrived at Edinburgh, in October 1706; and we find him no inconsiderable actor in that greatest of all good works. He attended the committees of parliament, for whose use he made several of the calculations on the subject of trade and taxes. He endeavoured to confute all that was published | by the writers in Scotland against the union; and he had his share of danger, since, as he says, " he was watched by the mob; had his chamber windows insulted; but, by the prudence of his friends, and God’s providence, he escaped.’‘ In the midst of this great scene of business and tumult, he collected the documents, which he afterward published for the instruction of posterity, with regard to cne of the most difficult transactions in our annals. In December 1706, he published “Caledonia,” a poem, in honour of the Scotch nation. Oh Jan. 1C, the act of union was passed by the parliament of Scotland, and De Foe returned to London in February 1707. How he was rewarded by the ministers who derived a benefit from his services, is uncertain. Mr. Chalmers is inclined to think it was by a pension. He published his “History of the Union” in 1709, though he was engaged in other lucubrations, and gave the world a “Review” three times a week. His history seems to have been little noticed when it first appeared, yet it was republished in 1712; and a third time, by his biographer, in 1786, when the union with Ireland had become a popular topic. In 1709 De Foe published his “History of Addresses,” which was followed, in 1711, by a second volume, with remarks serious and comical. His purpose plainly was to abate the public ferment with regard to Sacheverel, whose conduct, by a kind of fatality or folly, occasioned some eventful changes. 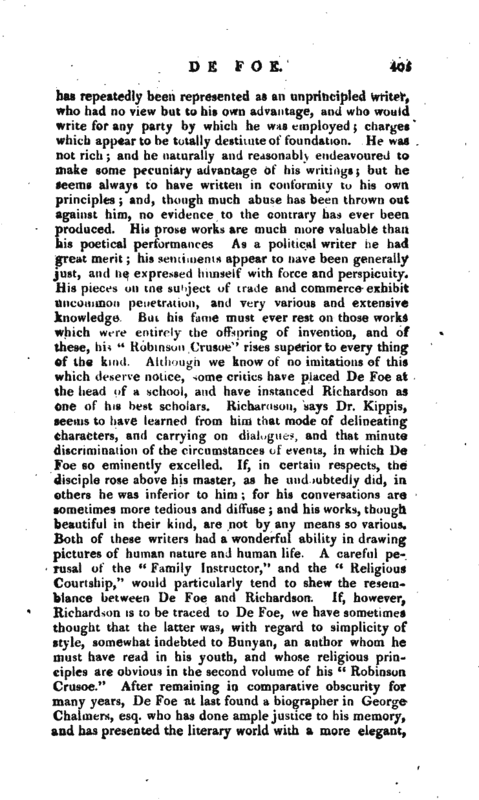 De Foe now lived at Newington, in comfortable circumstances, and was principally employed in writing the “Review,” which at last he relinquished after nine years continuance, and began to write “A General History of Trade,” which he proposed to publish in monthly numbers; but this history, which exhibits the ingenuity and strength of De Foe, extended only to two numbers. He appears, at last, to have been silenced by noise, obloquy, and insult, and finding himself treated in this manner, he declined writing at all, and secreted himself, for a time, at Halifax, or on the borders of Lancashire, where, observing the insolence of the Jacobite party, he wrote the following tracts, “A Seasonable Caution;” “What, if the Pretender should come?” “Reasons against the Succession of the House of Hanover;” and “What if the Queen should die:” those pamphlets, whose titles were ironical, were so much approved by the zealous friends of the protestant succcbbiun, that they were diligent to disperse them | through the most distant counties; ana 1 yet the reader will learn, with indignation, that for these De Foe wen arrested, obliged to give Soo/. bail, contrary to the bill of rights, and prosecuted by information, in Trinity term, 1713. This prosecution was instituted by the absurd zeal of Mr. auditor Benson. Our author attributes it to the malice of his enemies, who were numerous and powerful. No inconsiderable people were heard to say, that they knew the books were against the pretender, but that De Foe had disobliged them in other things, and they resolved to take this advantage to punish him. He was prompted by consciousness of innocence to defend himself in the “Review” during the prosecution, which offended the judges, who, being infected with the violent spirit of the times, committed him to Newgate in Easter term 1713. He was, however, soon released, on making a proper submission, and the earl of Oxford being still in power, that nobleman procured him the queen’s pardon, in November 1713. 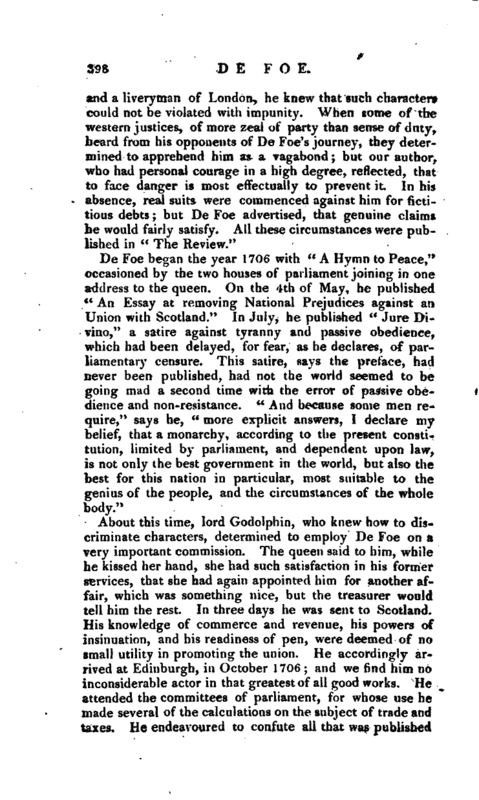 “No sooner was the queen dead,” says De Foe, “but the rage of men increased upon me to that degree, that their threats were such as I am unable to express. Though I have written nothing since the queen’s death; yet a great many things are called by my name, and I bear the answei’ers insults. 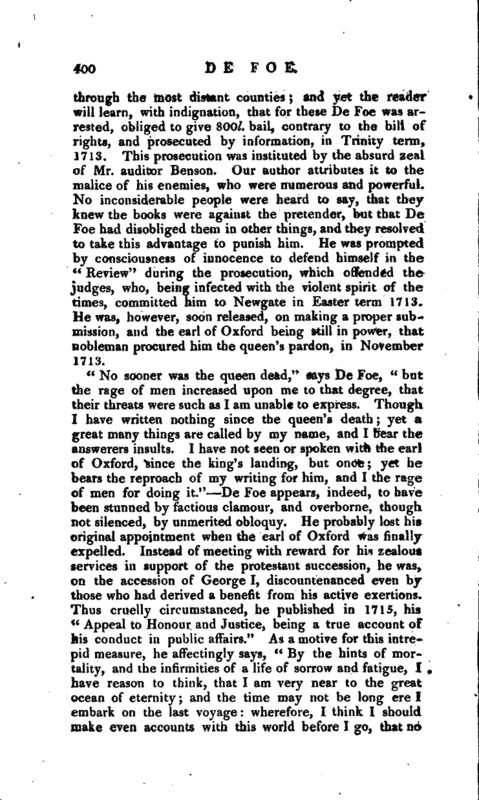 1 have not seen or spoken with the earl of Oxford, since the king’s landing, but once; yet he bears the reproach of my writing for him, and I the rage of men for doing it.” — De Foe appears, indeed, to have been stunned by factious clamour, and overborne, though not silenced, by unmerited obloquy. He probably lost his original appointment when the earl of Oxford was finally expelled. Instead of meeting with reward for his zealous services in support of the protestant succession, he was, on the accession of George I, discountenanced even by those who had derived a benefit from his active exertions. Thus cruelly circumstanced, he published in 1715, his “Appeal to Honour and Justice, being a true account of his conduct in public affairs.” As a motive for this intrepid measure, he affectingly says, “By the hints of mortality, and the infirmities of a life of sorrow and fatigue, I have reason to think, that I am very near to the great ocean of eternity; and the time may not be long ere I embark on the last voyage: wherefore, I think I should make even accounts with this world before I go, that no | slanders may lie against my heirs, to disturb them in the peaceable possession of their father’s inheritance, his character.” Before he could finish his appeal, he was struck with an apoplexy. After languishing more than six weeks, neither able to go on, nor likely to recover, his friends would delay the publication no longer. 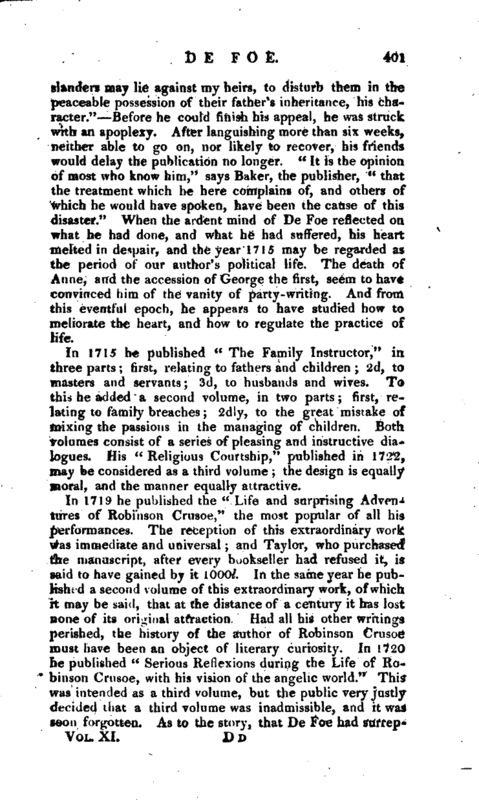 “It is the opinion of most who know him,” says Baker, the publisher, “that the treatment which he here complains of, and others of which he would have spoken, have been the cause of this disaster.” When the ardent mind of De Foe reflected on what he had done, and what he had suffered, his heart melted in despair, and the year 1715 may be regarded as the period of our author’s political life. The death of Anne, and the accession of George the first, seem to have convinced him of the vanity of party-writing. And from this eventful epoch, he appears to have studied how to meliorate the heart, and how to regulate the practice of life. In 1715 he published “The Family Instructor,” in three parts; first, relating to fathers and children; 2d, to masters and servants; 3d, to husbands and wives. To this he added a second volume, in two parts; first, relating to family breaches; 2clly, to the great mistake of mixing the passions in the managing of children. Both volumes consist of a series of pleasing and instructive dialogues. His “Religious Courtship,” published in 1722, may be considered as a third volume; the design is equally moral, and the manner equally attractive. In 1719 he published the “Life and surprising Adventures of Robinson Crusoe,” the most popular of all his performances. The reception of this extraordinary work was immediate and universal; and Taylor, who purchased the manuscript, afrer every bookseller had refused it, is said to have gained by it 1000l. In the same year he published a second volume of this extraordinary work, of which it may be said, that at the distance of a century it has lost none of its original attraction. Had all his other writings perished, the history of the author of Robinson Crusoe must have been an object of literary curiosity. In 172O he published “Serious Reflexions during the Life of Robinson Crusoe, with his vision of the angelic world.” This was intended as a third volume, but the public very justly decided that a third volume was inadmissible, and it was soon forgotten. As to the story, that De Foe had | surreptitiously obtained the papers of Alexander Selkirk, a Scotch mariner, who having suffered shipwreck, lived on the island of Juan Fernandez four or five years, it is scarcely worthy of serious refutation. Yet what is needful to repel this charge has been amply afforded by his late biographer. Selkirk, in truth, had no papers to lose; and internal evidence is decidedly in favour of the pure and entire originality of De Foe’s inimitable fiction. 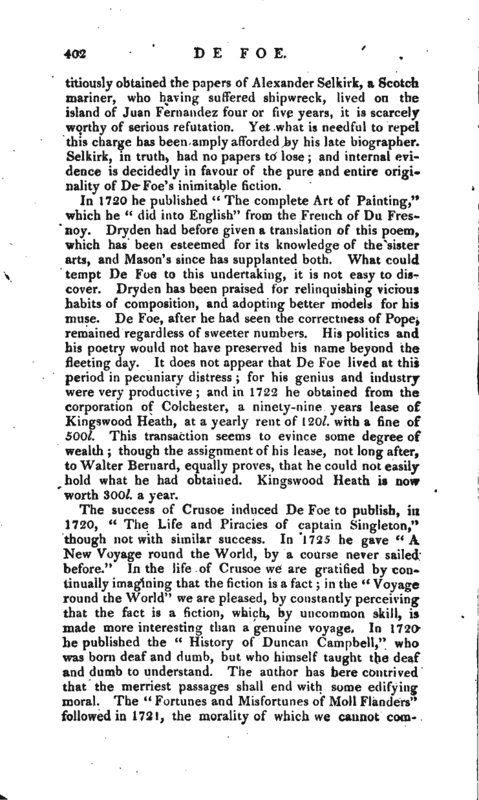 In 1720 he published “The complete Art of Painting,” which he “did into English” from the French of Du Fresnoy. Dryden had before given a translation of this poem, which has been esteemed for its knowledge of the sister arts, and Mason’s since has supplanted both. What could tempt De Foe to this undertaking, it is not easy to discover. Dryden has been praised for relinquishing vicious habits of composition, and adopting better models for his muse. De Foe, after he had seen the correctness of Pope, remained regardless of sweeter numbers. His politics and his poetry would not have preserved his name beyond the fleeting day. It does not appear that De Foe lived at this period in pecuniary distress; for his genius and industry were very productive; and in 1722 he obtained from the corporation of Colchester, a ninety-nine years lease of Kingswood Heath, at a yearly rent of 120l. with a fine of 50O/. This transaction seems to evince some degree of wealth; though the assignment of his lease, not long after, to Walter Bernard, equally proves, that he could not easily hold what he had obtained. Kingswood Heath is now worth 300l. a year. 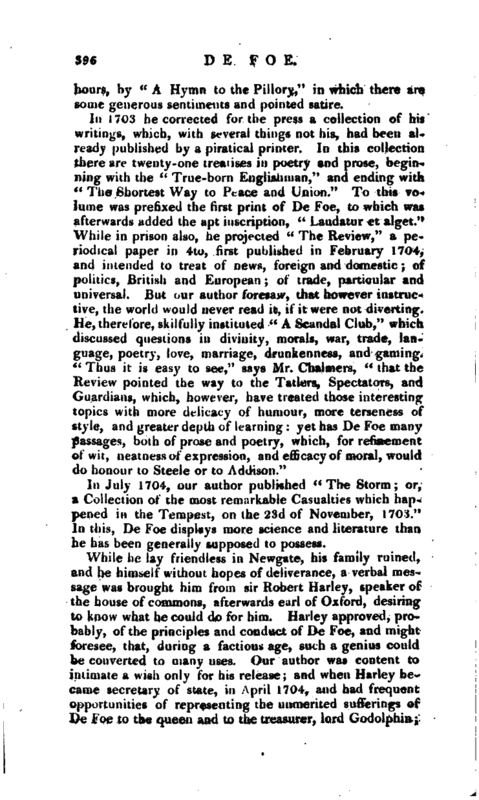 The success of Crusoe induced De Foe to publish, in 1720, “The Life and Piracies of captain Singleton,” though not with similar success. In 1725 he gave “A New Voyage round the World, by a course never sailed before.” In the life of Crusoe we are gratified by continually imagining that the fiction is a fact; in the “Voyage round the World” we are pleased, by constantly perceiving that the fact is a fiction, which, by uncommon skill, is made more interesting than a genuine voyage. In 1720 he published the “History of Duncan Campbell,” who was born deaf and dumb, but who himself taught the deaf and dumb to understand. The author has here contrived that the merriest passages shall end with some edifying moral. The “Fortunes and Misfortunes of Moll Flanders” followed in 1721, the morality of which we cannot | commend. The same year he published a work of a similar tendency, the “Life of colonel Jaque,” who was born a gentleman, but bred a pick-pocket. In 1724, appeared the “Fortunate Mistress, or the Adventures of Roxana.” The world, however, has not been made much wiser or better by the perusal of these lives, which may have diverted the lower orders, but are too gross for improvement, and exhibit few scenes which are welcome to cultivated minds. 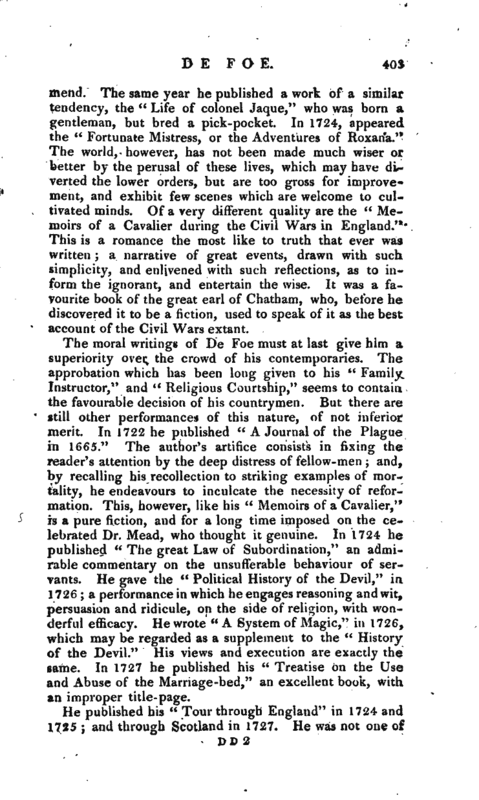 Of a very different quality are the “Memoirs of a Cavalier during the Civil Wars in England.” This is a romance the most like to truth that ever was written; a narrative of great events, drawn with such simplicity, and enlivened with such reflections, as to inform the ignorant, and entertain the wise. It was a favourite book of the great earl of Chatham, who, before he discovered it to be a fiction, used to speak of it as the best account of the Civil Wars extant. The moral writings of De Foe must at last give him a superiority over the crowd of his contemporaries. The approbation which has been long given to his “Family Instructor,” and “Religious Courtship,” seems to contain the favourable decision of his countrymen. But there are still other performances of this nature, of not inferior merit. In 1722 he published “A Journal of the Plague in 1665.” The author’s artifice consists in fixing the reader’s attention by the deep distress of fellow-men; and, by recalling his recollection to striking examples of mortality, he endeavours to inculcate the necessity of reformation. This, however, like his “Memoirs of a Cavalier,” is a pure fiction, and for a long time imposed on the celebrated Dr. Mead, who thought it genuine. In 1724 he published “The great Law of Subordination,” an admirable commentary on the unsufferable behaviour of servants. He gave the “Political History of the Devil,” ia 1726; a performance in which he engages reasoning and wit, persuasion and ridicule, on the side of religion, with wonderful efficacy. He wrote “A System of Magic,” in 1726, which may be regarded as a supplement to the “History of the Devil.” His views and execution are exactly the same. In 1727 he published his “Treatise on the Use and Abuse of the Marriage-bed,” an excellent book, with an improper title-page. Of some of his descendants less favourable accounts have been published. 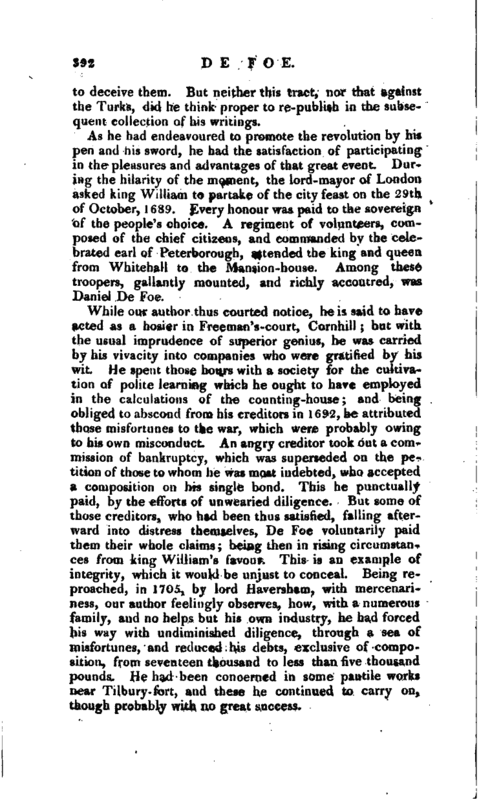 In 1771, John Joseph De Foe, said to be his grandson, was executed at Tyburn for a highway robbery; and in the —Gent. Mag. 1187,!s an scconnt of another grandson, living in the menial situation of cook, on board a sloop of war. 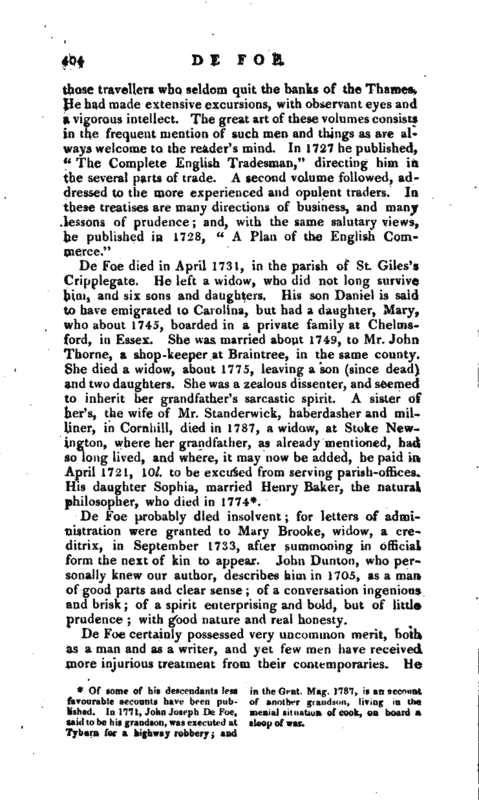 De Foe probably died insolvent; for letters of administration were granted to Mary Brooke, widow, a creditrix, in September I7<i3, after summoning in official form the next of kin to appear. John Dunton, who personally knew our author, describes him in 1705, as a man of good parts and clear sense; of a conversation ingenious and brisk; of a spirit enterprising and bold, but of little prudence; with good nature and real honesty. Life as above. Biog. Brit.